The Rock River Trail Initiative distributed free oak trees to the eleven counties of the Rock River corridor this week. 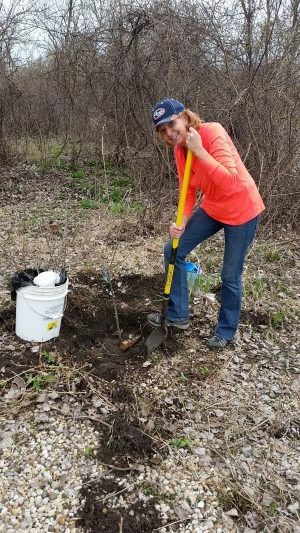 This marks the fifth year in a row that over 10,000 trees have been planted within the view shed of the Rock River in Illinois and Wisconsin – a total of over 50,000 hardwood trees donated by Living Lands and Waters of Moline, Illinois and distributed by the Rock River Trail Initiative. Below are photos of the tree distribution on April 24th at the Dodge County Administration Building in Juneau with Bill Ehlenbeck, Dodge County Parks and Trails Manager, and Jim Mielke, Dodge County Administrator, preparing the trees in plastic carry bags and three of the pick ups for municipalities and private individuals along the river. One of the distribution points along the river was the Dodge County Administration Building in Juneau. Bill Ehlenbeck is also a RRTI Council member. Thanks go out to everyone who made this year’s tree distribution successful!